Kitty cats are just about one of the cutest things you could imagine (well, that is unless you are a dog person instead). With their soft, fuzzy fur and wide, sparkling eyes, you could say that they are like our children in that with one look they can get whatever they want. If they are, in fact, a lot like our own kids, then it makes sense that they would love dressing up as a kitty cat for Halloween, right? After all, when you combine one cute thing with an already adorable one, you have a recipe for ultimate cuteness and maybe even a little sass! 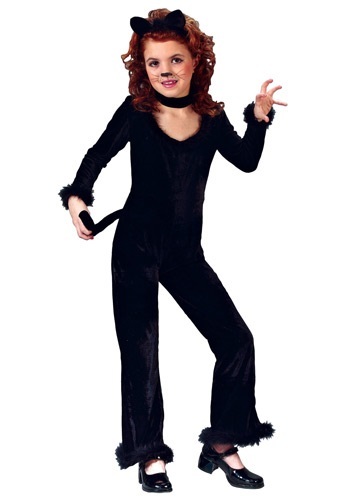 This Child Playful Kitty Costume is perfect for Halloween, a costume party, or dance recital. This kid’s cat costume comes with everything they need to become an agile kitty this Halloween. This black jumpsuit fastens with Velcro at the back of the neck for a comfortable fit and it has matching black marabou feather edging at the wrists, ankles, and front neckline for added unique detail. The black stuffed tail fastens to the back of the jumpsuit with Velcro and a velvet-covered headband has sewn-on cat ears and feather tuft. No one in your neighborhood has every seen a kitty cat quite like this one! Add black shoes and cat makeup to complete the look. She'll be one cool kitten!